This 1-3/8 inch wide Tungsten Carbide Saw blade is primarily for cutting hardened metals. This cutter will get you through tough metal cuts that our Titanium blades just cannot do. Titanium blades are great all-purpose cutters but they cannot handle heat treated hardened metals. This new Tungsten Carbide saw blade may not cut fast but it'll get you through tougher ferrous metal cuts. Use this blade to cut through cast iron pipes, Sheetrock screws, lag-bolts, concrete nails, small padlock shanks etc. With this Tungsten Carbide blade you can cut most tough metals. ALERT: Due to the high forces generated with this blade, it is important that the material you're cutting not move or vibrate when sawing. 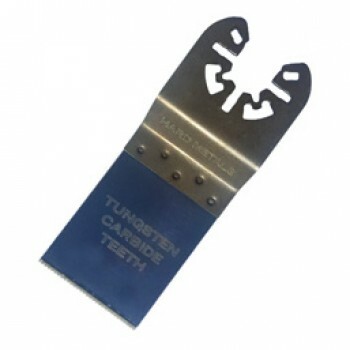 Please strongly secure your cut material before using this Tungsten Carbide blade. ATTENTION: When sawing hard metals with this Tungsten Carbide blade please try to maintain smooth cutting contact between the blade's teeth and the metal to be cut. While operating do not allow the blade teeth to jump and bounce against the cut surface. Shock loads and bounces will severely shorten the life expectancy of this blade. Employ a smooth and gentle left-to-right swing as you cut, this will get all of the blade's cutting teeth working for you. Use this specialty blade for dedicated cutting of hardened metals such as drywall screws, concrete nails and anchor bolts. Get this Tungsten Carbide saw blade only if our Titanium blades can't make the cut.